If you are looking if you are a winner of the Tour of the Stars you can see it HERE. Today mark the 3rd Day previews at Wplus9 September Special Release. 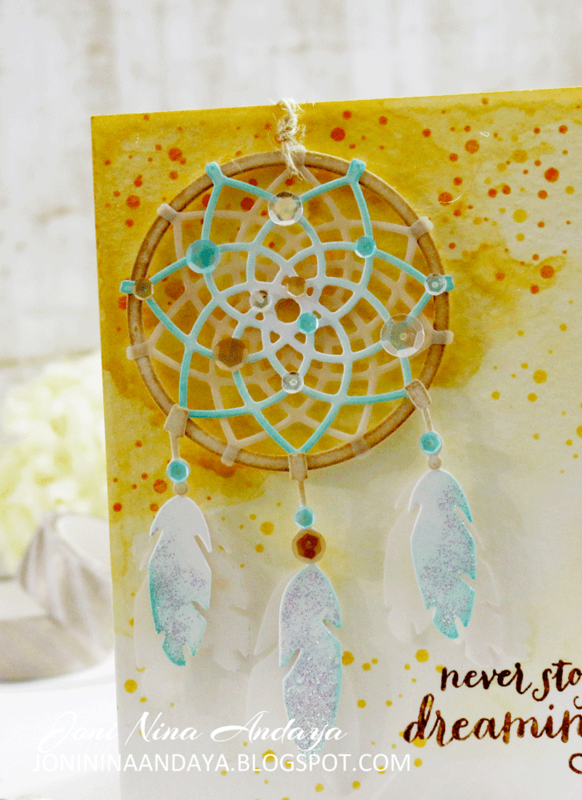 For my today's project is all about Dream Catcher simple one layer card. 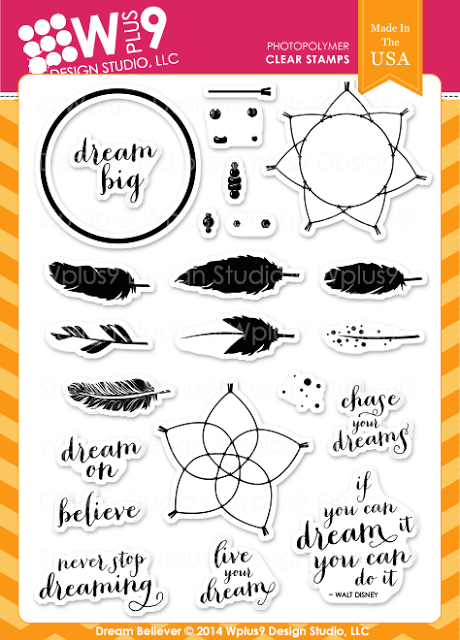 I simply love this new Dream Believer Stamp Set that will be available on September 5. Lots of second step stamping. To begin I first distress the panel with Peacock Feather Distress ink. Next I stamped the images with different colors along with the past release stamp set Fanciful Feathers...all time favorite :) This card is really easy to assemble. 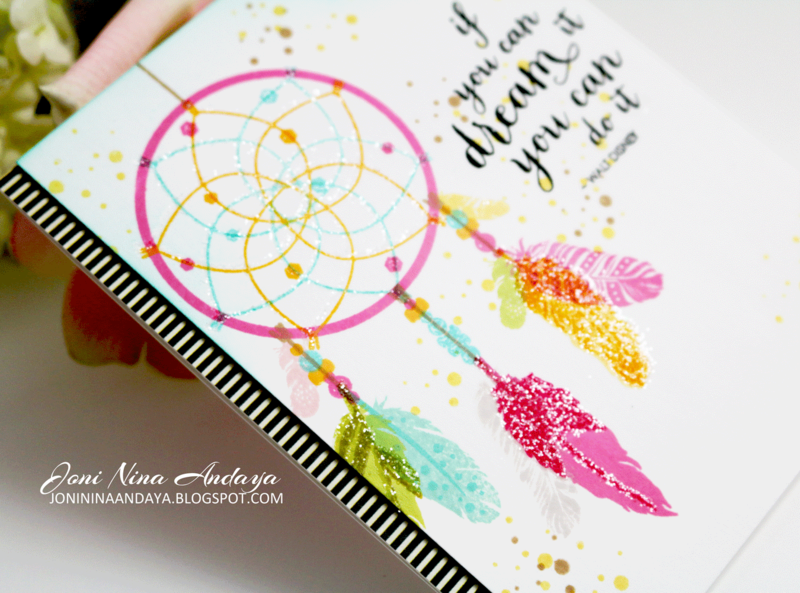 Once the images are all stamped together I then added the sentiment from the same set from Dream Believer Stamp Set. I also added some glitters on the webbing and to some of the feathers for glitz effect. My other Teamies Maureen and Kara are also sharing something today as well. 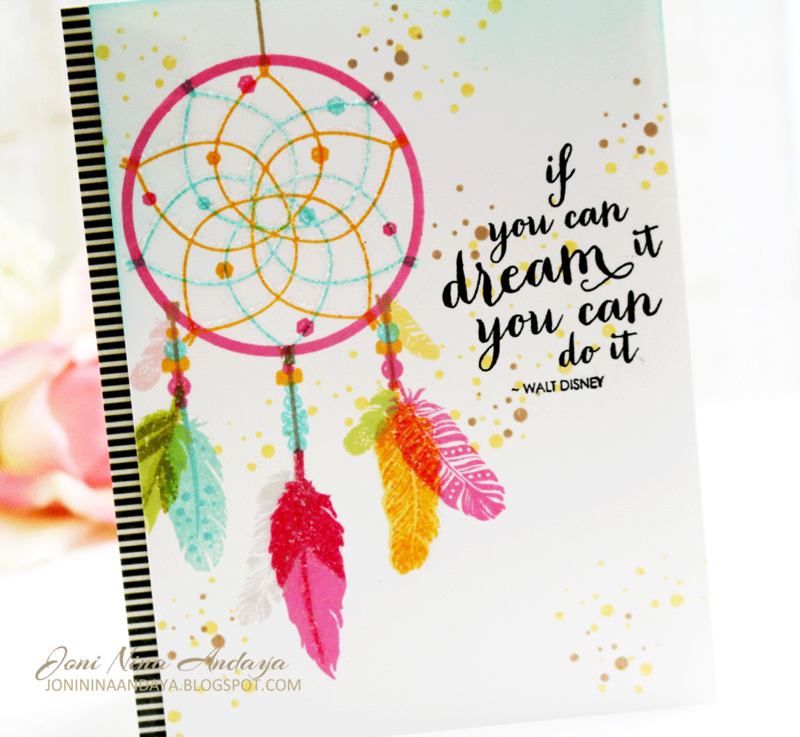 Dream Believer Stamp Set will be available September 5, 2014. Oh wow this is just stunningly creative. I just adore the colourful feathers, little splatters and how true is the sentiment. Gorgeous work of art, Joni! 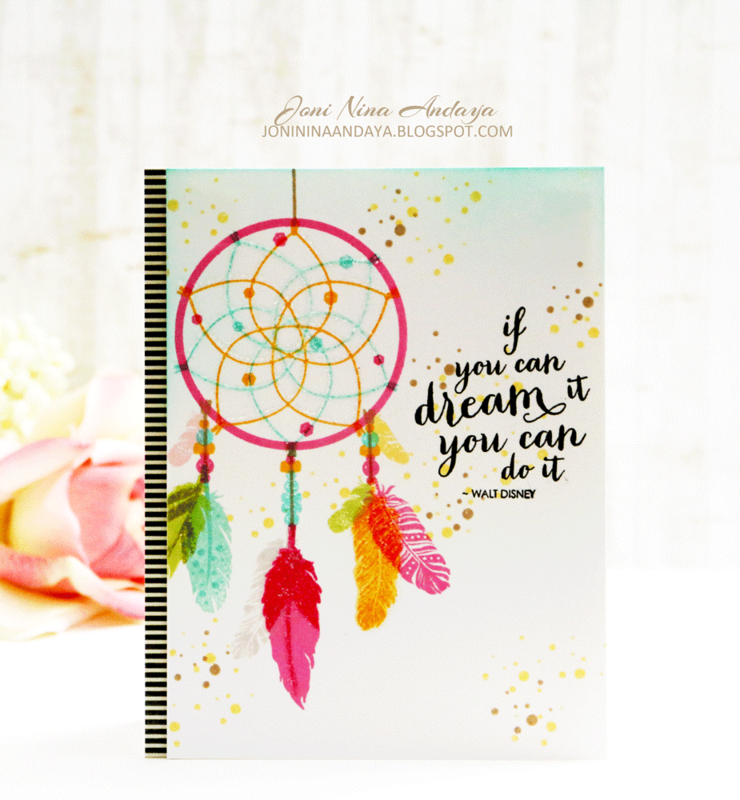 Fabulous card..all the colors make it so cheerful ! Beautiful and I love the sparkle you added! Just beautiful. I cant wait to get that stamps set. WOW! So stunning! Love it! Oh my gosh. This card is GORGEOUS!! Is it really only one-layer?!?!? It looks like so much more!! Spectacular Joni!! Love the colors! Love the partial sparkle on the feathers! I love how you mixed the two stamp sets, they are perfect together! Your card is so lovely. The sparkle on the webbing and feathers is wonderful as well as the touch of black going down the side to balance the sentiment. 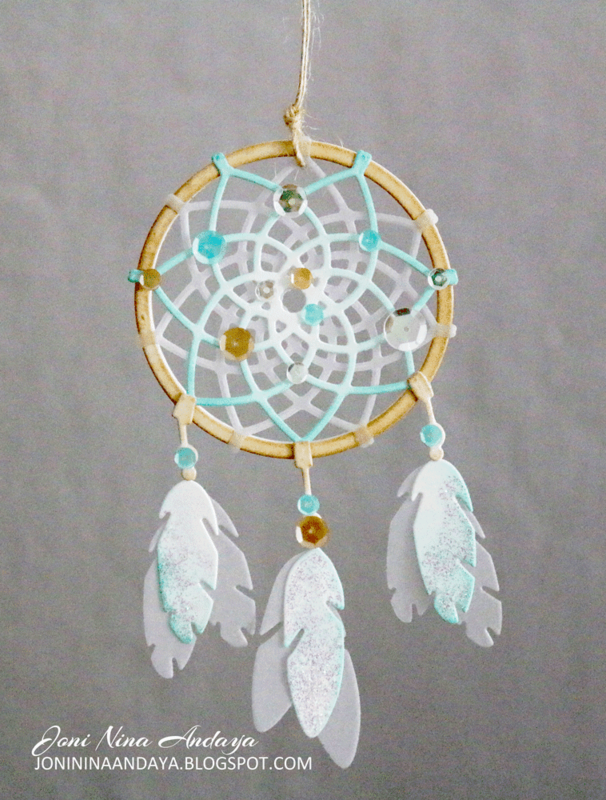 Such pretty dream catcher cards! Would be perfect for a teen birthday!